Good Samaritan College of Nursing and Health Science in Cincinnati. The pivotal “aha” moment leading up to her career choice? 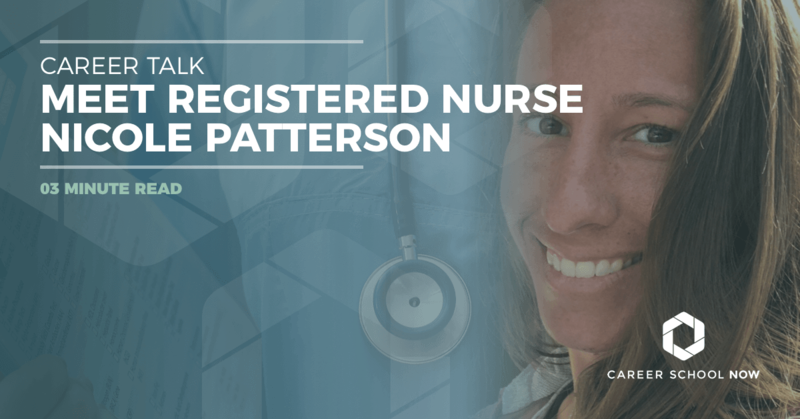 After she gave birth 13 weeks prematurely to her baby girl, the nursing care Nicole and her daughter received was so excellent that it sparked an interest in the field. She wanted to help people and impact them in the way the nurses did for her. Here are her personal views on being a RN. IS REGISTERED NURSING A GOOD CAREER? It is an amazing career! I truly love what I do. There are days that can be hard, but it is very worth it. It’s good money, good benefits, and very rewarding. You just have to find the field you are most passionate about. Learn how to become a registered nurse. WHAT DO YOU LIKE MOST ABOUT BEING AN RN? I love being able to form relationships and help people. I also like that there are so many different facets and opportunities within the field. WHAT ARE THE TYPICAL DUTIES OF AN RN? It depends on the nursing field, but in my work as an ER nurse, I assess patients, take vitals, start IVs, obtain lab work, and critically think through problems and symptoms. I have to know a vast amount of different things regarding healthcare, because as an ER nurse you see everything. I also have to access ports, give medications, and give blood and fluids. HOW IS NURSING DIFFERENT THAN WHEN YOU FIRST STARTED? When I first started, I worked as an adult oncology and ortho nurse. Now I work pediatrics, so the patient population is very different. My skills are different as well—as you get into your first year, you get better at time management, prioritization, and delegation. WHAT CAME AS A SURPRISE WITH THIS CAREER? I didn’t understand how much continuing education was involved. As nurses, you are always learning new information and procedures, plus better ways to do things. I also didn’t realize how long 12-hour shifts feel! You hear that you only work three days a week, but sometimes those all run together, and it can be exhausting. WHAT WAS NURSING SCHOOL LIKE? School can be difficult at times. It’s a different way of testing to get used to. You really have to learn how to critically think. Find a group of friends and get through it together! And don’t be scared of clinicals—get everything out of your education that you can. WHAT SHOULD STUDENTS CONSIDER WHEN CHOOSING A SCHOOL? Look at if it’s an associate program or a bachelor program. You can work with an associate degree pretty much anywhere and get your bachelor’s online while you work. The best part is that most places will reimburse you to get your bachelor’s. There is no salary increase from associate to bachelor’s, so why not work earlier? The only thing to consider with that is some children’s hospitals will only take bachelor degrees. I rode out my time, though, and got experience so I could get paid sooner than later. I’m where I want to be now. WHAT DO YOU THINK STUDENTS SHOULD BE AWARE OF WHEN GOING INTO NURSING? That the days can be hard sometimes. Both in school and in the field. Some of the tasks aren’t glamorous. If you specialize, you will have an easier patient load and more help: in ICUs and emergency rooms, for example. IS THERE ANYTHING ELSE YOU THINK PEOPLE SHOULD BE AWARE OF? Do your due diligence. Research schools and hospitals. And make sure to talk to other nurses who will give you more personal information regarding the whole process. WOULD YOU STILL CHOOSE NURSING? Absolutely! I would not trade this job for anything. Find a convenient nursing school: Start your career now!